Goldfish are some of the longest domesticated fish. Today there are something like 20 different breeds recognized around the world. Many of these breeds originated in China and Japan, but the US and some Europeans have gotten into the game in the last century. Of all the breeds of goldfish only a handful would actually be recognizable to most people as a goldfish breed. I’ll recount most of the common ones (and some uncommon ones) here. This is your basic pet store goldfish. These are often the fish you see in the horrible “feeder goldfish” tanks. They are the stereotypical goldfish and resemble the first ones ever domesticated. They can come in any color from white to black to yellow. Their fins are short and their bodies are stocky. Common goldfish, like all single-tail goldfish, are not suited for the typical home aquarium. Reports of these guys reaching 14 inches in a pond isn’t uncommon. They make good buddies with other single-tail goldfish as well as koi in a pond. They can be temporarily housed in large indoor tanks, but they are best kept in ponds away from fancy goldfish as commons will out-compete them. These guys are one step up from the common goldfish. Their bodies are a bit slimmer, and they gain long, flowing fins. Comets come in solid or bi-color. Commonly found in pet stores, these are all too often stuffed into horrible fish bowls. But they really do best in pond with other single-tail goldfish and koi. Sometimes called the poor man’s koi, these are the goldfish that most resemble the typical koi colors. They have the same body shape and fins as the comet goldfish but are all tri-colored. A well-bred shubunkin will also have rounded ends to their caudal fins. Like koi, shubunkins don’t have a place in the home aquarium. They are best viewed in ponds with comets and common goldfish. This was the first fancy goldfish, and today remains the most common fancy goldfish. Their bodies have the typical rounded shape, and their dorsal fin is split into four segments. They come in all colors from black to yellow to tri-color and can have a variety of tail sizes from short to the elongated veiltail. These are generally hardy fish, and depending on how severe the winters are they can be kept in ponds year-round. For a fancy goldfish they are boisterous and fast and shouldn’t be combined with some of the fancier varieties I’ll cover later. In terms of tank space, fancies are much less demanding than single-tail goldfish. A 30 gal (110 L) tank is just large enough to house two fancies, but really a 40 gal (150 L) or larger tank is best as goldfish like company. Another uncommon goldfish breed that is best kept in ponds. 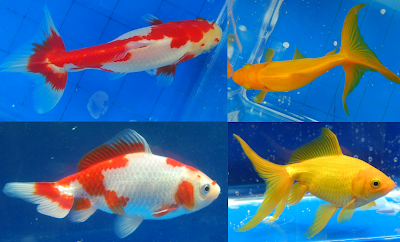 These fish are like common goldfish in body shape and growth, but they have a short double-tail. The long-tailed version is called a wantonai. Due to their large size, these fish are best left in ponds as in fact they were bred to be viewed as such. They aren’t found in many pet stores around the country, but many goldfish breeders will have them or be able to acquire them. A variation of the wakin is the jikin. Jikin have the same body shape, but have all white bodies and orange fins. Since these fish are hard to breed, they are even more uncommon than the wakin. Similar to the fantail goldfish, but oranda have a fleshy growth on their heads and operculum called a wen. Often times the wen isn’t fully developed until three or four years of age. Oranda can be fast and feisty when they are young, but the large wen will slow them down as they age. Sometimes it will obscure the eyes and cause the fish sight problems. The fins can be long or short, and they come in a wide variety of colors. This is another variety of fancy goldfish that is hardy enough to survive in some ponds year-round provided the temperature doesn’t go below 55F (13C). The redcap oranda is a specific variation of the oranda where the wen only develops on the top of the head. The wen is red, and the rest of the body completely white. This gives the fish an appearance like the tancho koi or the Japanese flag. My personal favorite, the ryukin, is another common variety of fancy goldfish. They have shorter bodies than fantails, but their bodies are thicker. The back should slope up sharply from the head and give a humped appearance. Their fins can be long or short, and they come in all colors from solids to calico. Because ryukin are so short, they often have digestion problems. Sometimes called “dragon goldfish” the telescope is another popular and widely recognizable fancy goldfish. They are defined by their bulbous, bulging eyes which give the fish a unique profile when viewed from above. This also gives them a sight disadvantage against other varieties of goldfish; for this reason they should be target-fed if kept with goldfish like fantails or orandas. They come in a wide variety of fin lengths and colors including solid, bi-color, and calico. When they are all black, telescopes are called black moors. The panda coloration (black and white) is another popular coloring. These little beauties resemble ryukin from the side, but show their true colors when viewed from above. Their fused caudal fins splay out to form a wide veil. They aren’t a very hardy breed, but are best kept in ponds as their tales are breed to be viewed from above. For this reason, they aren’t commonly seen in pet stores as few people can devote the energy to either heating a pond in the winter or constructing an indoor pond. They are most often seen in red and white, but some calico specimens are available. The breed was almost wiped out following the heavy bombing of Japan during WWII, but one breeder managed to find six fish still living in a restaurant. Today all tosakin goldfish are descended from those six fish. Still not common by any means, but gaining popularity is the chubby little pearlscale. These fish are even wider in body than ryukin. Their scales also have a pearlescences to them which gives them their name. Since their bodies are so bulbous, they usually have short fins to facilitate movement. They aren’t as hardy as the varieties I’ve previously listed, so they should be kept with other more fancy varieties. They are also prone to digestive problems due to their extremely rounded body. A pearlscale with a wen is called a crowned pearlscale. Usually the wens don’t develop as fully as they do in oranda, but they do further hamper the swimming ability of these fish. These fish are distinguished by their lack of a dorsal fin and the presence of a wen that extends down the cheek. You may think this renders them rather useless at swimming, but they are adept enough to compete with oranda and ryukin. They come in all colors and typically have short fins. While not seen in all pet stores, they are found in some throughout the country and can be ordered online from breeders. This is one of the most modified and fancy goldfish commonly seen. These goldfish have no dorsals, and their eyes bulge and face skyward, hence the name. This gives them a severe sight and swimming impediment. This is one of the breeds that does best in a single-breed aquarium with low water flow and no sharp decorations. Another highly modified breed of goldfish. These fish are defined by the large fluid-filled sacks that extend from under their eyes. They lack a dorsal fin and their eyes bulge upwards, too. Those fluid filled sacks are rather delicate and can be burst by objects in the aquarium. They will grow back and repair itself but the two sacks will not be equal in size anymore. Due to their delicate nature, they are best kept in single-breed aquariums. These goldfish are too delicate to combine with most other fancy goldfish. The images of fish and breed descriptions I have given you are from goldfish clubs and breeders. Often times pet store goldfish won’t quite fit into these categories nicely because they haven’t been bred for show. Sometimes you just have to take your best guess at what your pet goldfish is. If you have any questions, feel free to post a picture!